I love fall. How many times do you hear people say that? Cliched or not, it is my favorite season. I love turning off the air-conditioner and opening the windows to let the cooler air in, putting on cozy sweaters to walk outside and see the riot of colors in the changing leaves, and I love making soups and stews and other hearty dishes that make me feel all warm and toasty. But here in Maryland, fall seems to have a personality disorder. When we had our first chilly days I immediately planned and shopped for a variety of warm and comforting meals. We had a delicious chili that I threw together, but the next day, when i had planned a big pot of tomato and sausage risotto, the temperature was already shooting back up. To 80 degrees. In October. I am from Buffalo; I am not made for such tropical temps. Luckily, one of the dishes that I had planned, this scallop and corn chowder from Real Simple, perfectly bridged the gap between the summer-like weather and my desire for soothing soups. 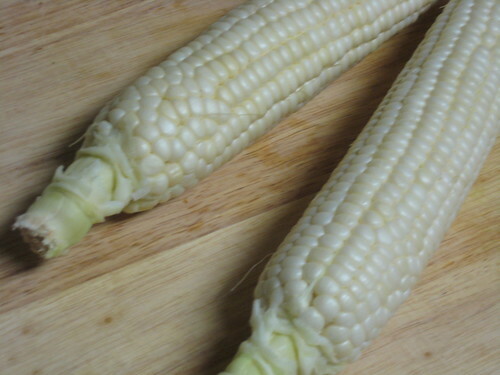 Whole Foods had some still-gorgeous sweet white corn, which kept the soup feeling summery and really elevated the flavor. Because I am cream-phobic when it comes in large amounts, I swapped in some half and half. This kept the chowder light while still providing some richness. I also upped the amounts of broth and half and half because I wanted it more "soupy"and less like the bowl of scallops and corn with a cream sauce that was depicted in the cookbook photo (The picture actually shows a fork resting in the bowl. Call me crazy, but I like to eat chowder with a spoon). Now, it is time for another confession. I bought frozen bay scallops for this dish. The original recipe calls for one and a half pounds of sea scallops to make four servings. Since I am already in danger of putting us in the poorhouse with my grocery non-budget, I decided not to spend an inordinate amount of money on sea scallops that had probably been frozen before making their grocery store debut, and that really didn't look so hot in the first place. You can, of course, splurge on fresh scallops from a reputable fish monger, but the tiny bay scallops that I used turned out to be fantastic in this dish. The scallops were similar in size to the vegetables, so it was easy to get a scallop, a chunk of potato, a couple of corn kernels, and a bacon lardon in each delectable bite. And yes, I said bacon. The dish starts by rendering the bacon and then cooking the scallops in some of the bacon fat, which gives the chowder a smoky backdrop. Then the onions are caramelized in the bacon drippings, which have now been infused with the scallop juices. 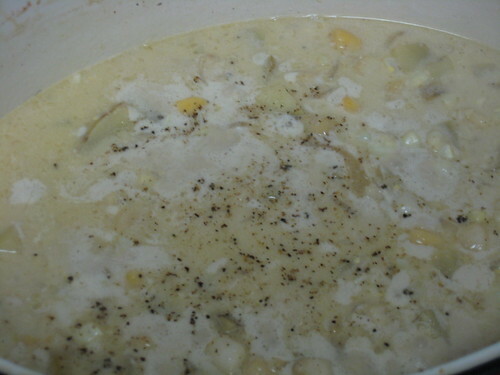 The pan is deglazed with a hefty amount of white wine, then simmered with the half and half and broth. Ooh, I want this again. Right. Now. I do have one caveat about the amount of wine used: it is not subtle. If you do not like a bold wine flavor, then you can use chicken broth, or a combination of wine and broth. But here there were no complaints, only seconds. Cook bacon over medium heat until crisp. Transfer with a slotted spoon to a paper towel-lined plate; set aside. 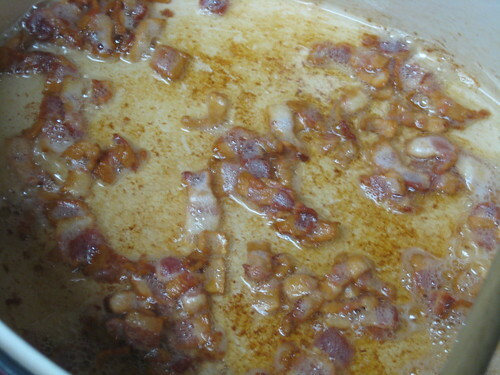 Pour off all but a tablespoon or two of the bacon drippings. Rinse the scallops and pat dry with a paper towel. Season with salt and pepper. Increase heat to medium-high. Add scallops to the pan and cook 1 to 2 minutes, until lightly browned. Transfer to a plate and set aside. Reduce heat to medium. Add onions and cook until softened, about 5 minutes. Stir in the wine, then add the potatoes, broth, and half and half. Bring to a simmer. Cover partially and simmer gently until the potatoes are tender, about 20 minutes. 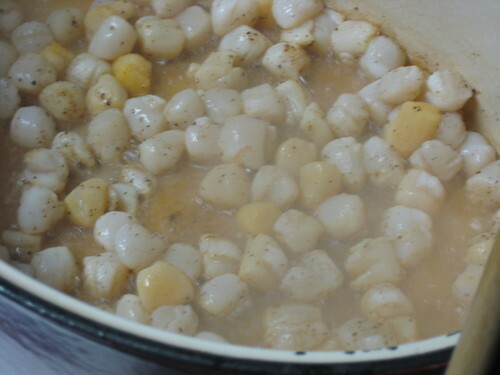 Add the corn and cook for 4 minutes, then add the scallops and cook about 2 minutes, until they are warmed through. 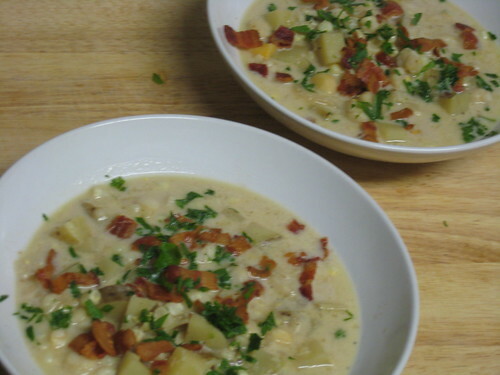 Ladle soup into bowls and sprinkle with bacon and parsely.